The oldest houses in Winnipeg are built of logs. You can see such logs in the William Ross House in William Whyte Park opposite the CPR station, because the narrow wood boards that used to cover them have been removed. The Ross House was built on the bank of the Red River at the foot of Market Street and was saved by the Manitoba Historical Society when the land was sold in 1948 for industry. It was moved to its present site and a cement foundation was put under it, but the logs and the little paned windows remain the same as they were one hundred years ago. Inside among the furnishings are an old spinning wheel, iron cook pots, and hand made chairs. William Ross was made postmaster on 28 February 1855. You can see the brass scales on which he weighed the letters. There were no stamps then. You just paid money. When summer comes you can visit this old log house, buy new stamps, mail letters, look at the furnishings, and imagine how it was to be alive one hundred years ago. You can’t see the logs in the old Barber House at 99 Euclid Avenue just north of the CPR station, because plaster has been put on top of them. Mrs. Lily Barber Sparrow lives in this house where she was born eighty-four years ago. At the top of the little staircase is a railing, hand carved, with spindles an inch square. You can’t shake them. They’re strong as iron bands. In the hall downstairs is an armchair covered with a buffalo rug. It’s warm and cozy to sit there beside a little iron stove, called a Carron store, that is bricked into the wall like a small fireplace and warms two rooms. When it was built there were no CPR tracks and no Euclid Avenue. Main Street was called the High Road, and was only a cart trail. You may wonder why the house is turned cornerwise to the street; that’s because it was built to face Fort Garry away to the south across the bends of the Red River. There was another place the Barber house could see—the big house of Robert Logan, the pioneer trader who bought Fort Douglas. When Barbara Logan left her father’s house to become the bride of E. L. Barber she wanted to be able to look across the prairie to her old home. That’s why the house on Euclid Avenue is on a slant today. Her daughter, Mrs. Sparrow, would like the old log house to become a museum. No. 160 Newton Avenue, West Kildonan, doesn’t show its logs because it is covered in with modern building materials. But notice the small paned windows. That’s a sign of a pioneer house; the glass came from England in sailing boats, and big pieces would have broken. 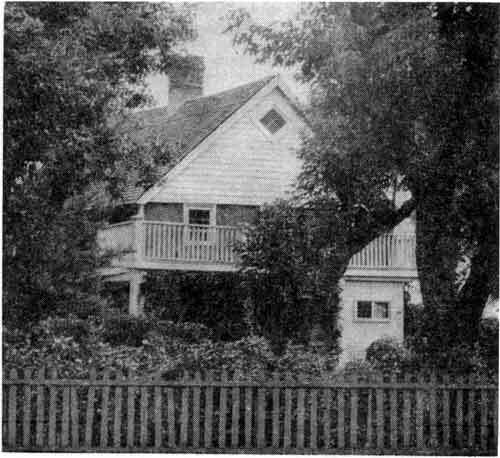 This log house was first built in 1839, where Bannerman Avenue is now. When Mr. and Mrs. John Fraser had been married 21 years they wanted to live nearer the new Presbyterian church. So they took down their log house and rebuilt it, log by log, where it stands today. They always had family worship. The children took turns reading a verse from the Bible. In church Mr. Fraser kept the choir in tune by sounding his tuning fork, a little polished iron fork of two prongs. Seven Oaks House on the Inkster estate covered over with siding, is empty and waiting now for something nice to happen to it. Mary Inkster, sister of Sheriff Colin Inkster, gave it to the city for a park. But no park was built around it. A service club would like to turn it into a museum, but that takes lots of money. It was built in 1851.